Since the beginning of the year, default swap rates on European bank debt have increased meaningfully despite the fact that measures of counterparty risk, and specifically the Libor-OIS spread which Alan Greenspan referred to as a “barometer of fears of bank insolvency,” have remained stable. The reason for deteriorating default swap rates is as much confusion over the status of senior bonds in the capital stack as worsening bank business conditions. The specific catalyst was action by the Bank of Portugal on December 29th to novate EUR2bn of senior bonds from Novo Banco (the “good bank” created from the August 2014 bail-out of Banco Espirito Santo) to the bad bank; the market value of the bonds promptly fell from ~90 cents to ~10 cents. The action followed a November ruling from the ECB, following its stress tests, that Novo Banco needed to raise EUR1.4bn of capital. Typically, a stress-capital shortfall would be met within a 6-9 months window through asset sales, an equity-raise, and/or a bail-in of bonds (i.e. conversion of debt to equity). Meeting a capital shortfall, as opposed to addressing insolvency, through outright debt cancellation is a radical policy departure particularly when, as in the case of Novo Banco, the cancelled debt was held by institutional investors while pari-passu bonds held by local individual investors were unaffected. This bail-in power can be exercised when a financial institution is determined to be in financial distress so that senior bondholders can face losses even when a borrower is not insolvent. A resolution authority can treat some creditors better than similarly situated creditors provided only that all creditors receive at least what they would have received in insolvency proceedings. Bank investors are confounding bail-in risk and counterparty risk for European banks so that the stocks of the US money-centers are meaningfully over-discounting systemic risk. By bail-in risk, we mean the risk that, because of capital inadequacies, bank debt will be subject to coupon-interruption, write-down, conversion to equity, or other impairment as a result of regulatory action, management action, or automatic triggers in the contract (as in the case of contingent convertible securities or CoCo’s). By counterparty risk, we mean the risk that a bank is not able to meet its obligations in the overnight funding markets. Counterparty risk is measured by the Libor-OIS spread (Alan Greenspan’s “barometer of the fears of bank insolvency” – see Appendix) which, while somewhat elevated relative to last year, is running at ~25 basis points for 3-month USD. It is not at distress levels (compared with over 3.5% in 2008, for example) and has not increased since the beginning of the year (Chart 1). Bail-in risk is measured by credit default swap rates which have deteriorated sharply since the beginning of the year for leading European banks both for senior debt (Chart 2) and for subordinated debt which is now trading at distressed prices; for example, and as discussed in our report yesterday “Systemic Risk and Deutsche Bank”, the 6% contingent convertibles of “CoCo’s” are trading at close to 75 cents down from ~95 cents at the beginning of the year. It is easy to misread the signal from the bank credit default swap market because default no longer means bankruptcy (and hence inability to meet counterparty obligations) but the conversion of debt to equity (and hence increased ability to meet counterparty obligations). Yesterday, for example, the primary driver of the pricing of bank debt securities globally was concern over whether DB would make coupon payments on its CoCo’s and global bank stocks rallied off lows in the afternoon when DB issued an ad hoc press release confirming what CFO Marcus Schenck had reported in the last earnings call on Jan 28th: that the bank expected to have sufficient payment capacity to service the coupons on its Additional Tier 1 (AT1) Capital and estimating this capacity at EUR1bn versus the coupon payment of EUR0.35bn due at end-April. Coupon payments on DB’s CoCo’s are at management’s discretion so that an interruption would not constitute a default event under the terms of the default swaps covering subordinated debt. The write-down of these bonds would constitute an event of default but does not occur under contractual terms until DB’s CT1 ratio falls below 5.125% versus the current ratio of 11.1% (or 11.7% after taking account of the sale of the bank’s stake in Hua Xia bank which is expected to close in 2015Q2). Regardless, the bail-in risk has almost surely affected the price of default swaps on subordinated debt as CoCo holders look to insure against price-risk. Contingent convertible bonds are, by definition, subject to contractual provisions under which they may be written down or converted to equity. However, under the EU Bank Recovery and Resolution Directive (BRRD) which went into effect at the beginning of the year, senior unsecured debt can also be subject to bail-in at the discretion of the regulators and independently of contractual terms. This is also now true of CoCo’s so that the only difference between senior and subordinated debt, from a bail-in perspective, is that the latter may have contractual triggers; both claims are subject to bail-in if regulators deem necessary. Specifically, Article 55 of the BRRD requires a creditor “to acknowledge and accept that the amount due to it may be subject to cancellation, reduction, or conversion to other types of securities in the event that a resolution authority exercises its bail-in power”. In theory, senior bondholders stand pari-passu so that regulators would apportion bail-in losses equally among them; in practice, regulators can do what they like. This was demonstrated to the market by Bank of Portugal which, as regulator for Novo Banco (formed as the “good bank” bail-out of Banco Espirito Santo in August 2014 by acquiring its branches, deposits, and creditworthy assets along with a EUR4.9bn equity infusion), transferred EUR2bn of claims to the “bad bank” (which acquired the un-creditworthy assets in the Espirito Santo bail-out). This transfer occurred on December 29, following a November ruling by the ECB that Novo Banco needed to fill a EUR1.4bn capital shortfall in stress tests, and caused prices of the transferred bonds to fall from ~90 cents to ~10 cents; furthermore, the Bank of Portugal selected the senior bonds for transfer based on ownership by foreign institutional investors, mostly Pimco and Blackrock, while other senior bonds of equal standing owned by Portuguese retail investors were not transferred. The policy actions of the Bank of Portugal, and lack of response so far from the ECB, has rattled senior debt investors and likely explains the increase in default swap rates for senior debt. Senior bondholders understand that, in the even a bank becomes insolvent, they will bear losses in a pari-passu fashion. What has confounded them in the case of Novo Banco, and caused a repricing of default swaps, is: (i) that the bank was not insolvent but rather faced a capital shortfall in stress tests that could have been met within the typical remedy period of 6-9 months through asset sales, raising equity, or a bail-in of debt (i.e. conversion of debt to equity) rather than what amounts to a permanent write-down; and (ii) that senior bondholders were not treated equally with institutional holders being discriminated against versus individual bondholders. 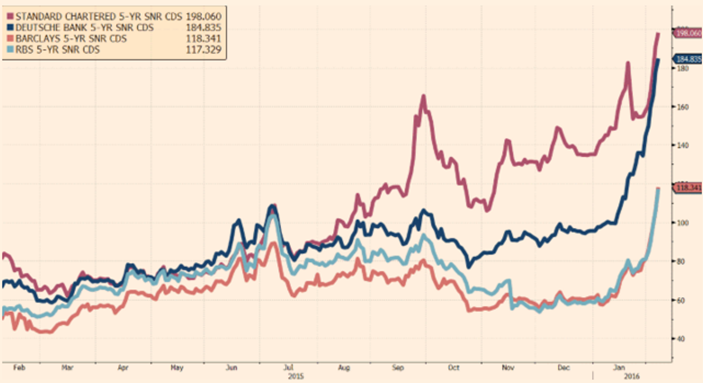 The ECB has not intervened so that bondholders are taking their case to Court. Banks can operate in the wholesale markets for unsecured, offshore US$ funding by rolling liabilities overnight, and paying a rate based on the effective federal funds rate, or terming out funding for a period, say 3-months, and paying a rate based on the London interbank offer rate or Libor. Libor-based funding removes the risk to the borrower that it cannot roll funds overnight and commensurately exposes the lender to the risk of borrower default over the term of the loan. (As a rate for unsecured funds, Libor tends to trade at or above the “repo” rate for secured funds). Banks that do not want to take roll-risk and rather keep the liquidity of, say, a 3-month term point but believe rates will fall more than expected over this period may accept an unsecured deposit but swap out of the Libor-based rate and pay an overnight rate instead. This gives rise to an overnight indexed swap (OIS) where the borrower receives a Libor-based rate and pays a rate tied to a published overnight rate index such as the effective federal funds rate. 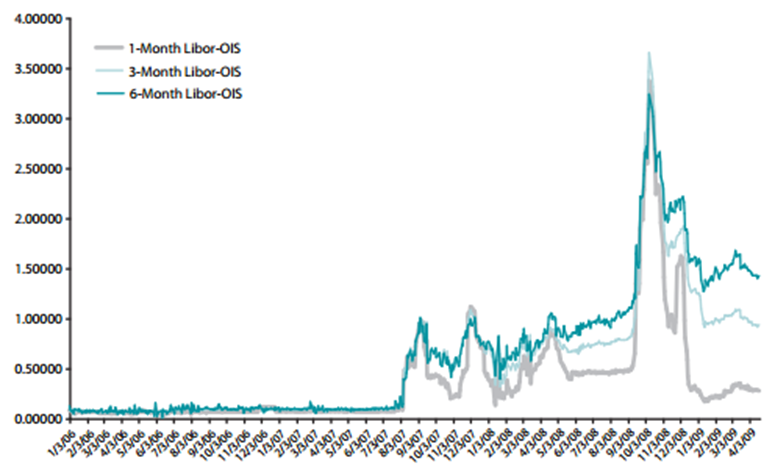 The difference between the Libor rate and the OIS rate is referred to as the Libor-OIS spread. A key distinction between the Libor and OIS rates is that the former assumes an initial exchange of principal (in the form of an unsecured, offshore deposit) while the latter does not: any net interest obligation arising from the difference between the fixed and floating legs of the swap is exchanged when the contract matures. As a result, the Libor rate incorporates a market assessment of default risk on principal while the OIS rate does not. The Libor-OIS spread therefore provides a measure of bank assessment of counterparty risk in the interbank funding market (hence Alan Greenspan’s reference to it as a “barometer of fears of bank insolvency”). As noted above the Libor-OIS spread for a 3-month term is currently ~25bps and, while higher than the average level in 2015 of ~15bps, is not signaling distress despite the headlines around energy, around China, and around default swap spreads for European banks. For context, the Libor-OIS spread increased to 1% in September 2007 as Northern Rock failed in the UK and over 3.5% in September 2008 as Lehman failed (Chart A1).